You'd be amazed how much light you can gain from a single-hinged glass door. This classic style incorporates for glass lites and a conventional panel that rides above the bottom raid. The period knob adds authenticity, but optional dead bolt locks and an auxiliary head lock keep your glass door securely latched. Tall, narrow glass lites invite sunshine into your den, utility room, or home office. 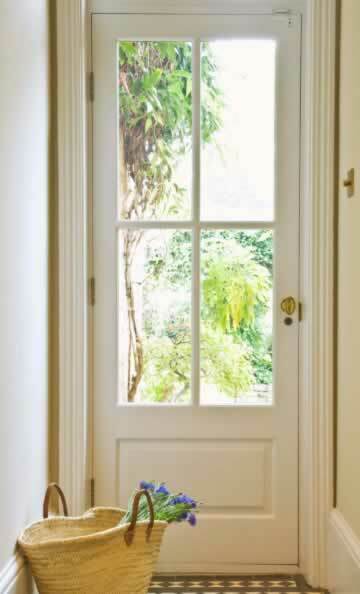 Vinyl doors offer greater insulation properties than their wood predecessors, and weather stripping , e-coatings, and double paned glass windows can boost your home's ability to retain heat in winter and cool air in the summer. This glass door is the perfect antidote for a dim, narrow hallway. Added greenery beyond the glass lites can transform your interiors, and your mood!